Posted April 23, 2011, 2:21 PM. Overnight showers and drizzle are possible tonight and Sunday morning in Southern California's inland valleys, as a moist system enters the region from the northwest. A band of moist clouds was off Point Conception Saturday afternoon, and will be sweeping in later tonight, with winds increasing as the front approaches. 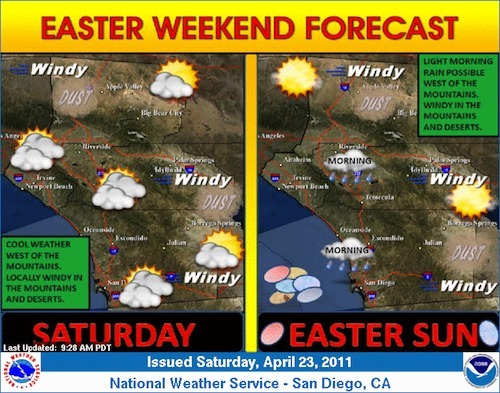 Rain showers chances were running between 20% and 30% for later Saturday night though Sunday morning. The range of predicted rainfall for the inland valleys is between 0.01" and 0.10". April has been relatively dry so far, despite a series of systems that deepened the marine layer this week, causing drizzle on a few mornings. Only Beaumont had picked up any real precipitation, however, recording 0.11" since Monday.